Having impressively climbed the corporate ladder, Phil Crowshaw had worked as a Head of Communications, Sales and Marketing Director, Customer Service director, and UK Managing Director. He enjoyed a six-figure salary and a fancy car, but that didn’t stop him waking up one morning and wondering if this was it? In 2004, he decided to go off and research success, having been fascinated by what the main drivers are for successes and why certain projects and people do so well. And that’s when he set up on his own and created what was probably one of the first online TV channels. Interviewing successful people from all walks of life, they share their personal journeys and mistakes. Starting before YouTube was even a thing, Phil still carries out these interviews today. Considered as a guy with his finger on the pulse, he has now spent the past 13 years consulting, coaching and speaking, in between flexing his entrepreneurial muscles selling online. Phil shares with us not only how he started and grew his business, but also how he has been able to use video a method for gaining new business. No matter who he has spoken to during his process of interviewing business owners, they all define success as being free in one way or another. And that’s exactly why Phil himself left the corporate life. Being ambitious and driven had gotten him high up the corporate ladder. But he also wanted to control his own destiny. The higher he got up the corporate hierarchy, the worse the politics were getting. He wanted to try something new and now gets enjoyment from getting things done and making a difference to people. At the start, Phil had been researching success and achievement because of his own interest in it and personal development. It started as a bit of fun and had no intention of monetising it. As he began to actually identify those components, it became clear that he could help deliver inspiration and insights to others. This became the driver for the training courses he ran, utilizing the interviews he’d already shot with other people. But one thing he did discover that going into business by yourself is a lot lonelier than working in a corporate environment. It isn’t until you lose those resources that you appreciate them. When controlling your own business, you’re the director of everything, and there is no IT department to call when the computer is on the blink. Almost everyone underestimates how hard it is to go it alone. When Phil quit his job, he thought he’d be free. The reality is that although you are free, you can’t just work four-hour days. Becoming a business owner is an often over-romanticised notion, and it takes a lot of hard work and graft, as well as overcoming the hard times by yourself. When you’re a business owner, you understand that there isn’t a nice straight line which goes along step by step. Instead, there are high points and dips, with good times and not-so-good times. Phil experienced this himself during the banking crisis of 2008 when he lost three of his clients over a fortnight, and he soon began to wonder how he would afford to pay his mortgage. Despite that, and every other low point, he has learned something in every situation. And at the time, every decision was made with all the knowledge he had at that moment. So when he looks back, he doesn’t see anything that he’d actually change with hindsight. Even the fact that he started up the business originally with three other people who all had their own opinion on the route they should take with the business. The lack of control was frustrating and he eventually ended up buying them all out. Of course, he would not have been able to start the business up by himself in those early days without them. So although not ideal, it was still a necessary step to get his business to where it is today. If it isn’t already, then video isn’t far away from becoming mainstream. A one-minute video is more popular to watch than reading an About Us page and is fast becoming the favoured way to consume information. There are different forms of video which Phil uses. He creates videos using slides from a presentation and adding a voice-over. Using Zoom, which is free, he conducts interviews with people over the internet as if they were sat in the same room. He also records his thought of the day to share with his subscribers. He even goes a bit old school and actually records physical videos on his camera as well. Whatever types of video you decide to create, keep it constant. That way, you’ll soon have a library full of content. And the phenomenon of video is only going to continue with live videos becoming increasingly popular. 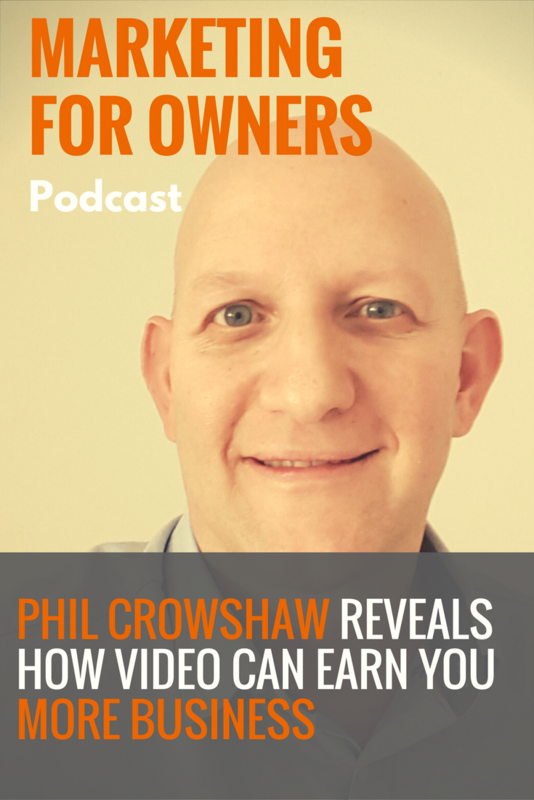 You have to earn the attention of people now, and video is Phil’s favourite tool for doing so. Putting an advert out isn’t enough to build relationships and trust. So he uses the videos to sharing his insights and interviews with other people to provide people with actual value. When it comes to B2B, it is often hard to get yourself in front of the big decision maker with the authority and influence to want to do business with you. Most people are time poor and haven’t got the time to listen to others pitch for their business. So Phil uses his video interviews as a Trojan horse. He starts by identifying his market prospects and the people he’d like to do business with within his local area, and will then contact a senior member in the business saying he wants to interview them. There are always people who are keen to do it so they can share their story and expertise. So when he connects with them using LinkedIn, he explains what he has done in the past and they often want to find out more. He feeds their ego. And as a thank you, he’ll offer to give them a copy of the video, usually worth £400, to them for free. They can use this as they please, but it will carry his own branding. When it comes to conducting the interview, he is then sat in front of them, and general conversation will lead him to be able to tell them what he does. By doing this in another purpose they can build the relationship and rapport, with the sales meeting element disarmed. The completed videos are then edited simply using Windows Video Maker, in which he adds an introduction and his branding to the finished video asset. But he then uses this in different ways and slices it up into short videos with one or two questions. People are always looking for quick lessons, and it allows him to use it many different ways, posting on social media and including in his courses. Phil will soon be launching Be My Guest Live where he will be interviewing successful people live on stage in front of an audience who can then ask their own questions as well. So make sure you connect with Phil in some way to make sure you’re one of the first to hear about them. At Geeky Group, you can find out a lot more about what he does, as well as signing up for his next training workshop and watching a selection of his Be My Guest interviews. Also feel free to contact him if you want to discover how what he does can work for you.